WHEN I ASK HOW OLD YOUR TODDLER IS, I DONT NEED TO HEAR 2 - ProudMummy.com the Web's Community for Mums. 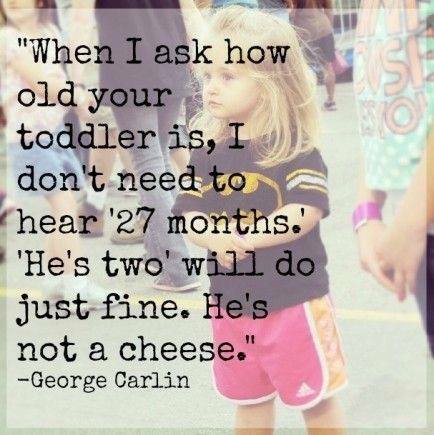 "WHEN I ASK HOW OLD YOUR TODDLER IS, I DON'T NEED TO HEAR '27 MONTHS.' 'HE'S TWO' WILL DO JUST FINE. HE'S NOT A CHEESE." Hollie Longmore weren't we having this exact convo the other day? Ha I have 3 children. When people asked how old my first was I could practically tell them by the day. By the 3rd I'm like umm about 8 months. Seriously so sick of seeing these kind of posts. Mothers go through a lot to birth their kids, if we want to count the time after by months then we can. I personally like to up until they are two, but who cares. My youngest is currently 20 months old, her clothing size backs me up lol!